The great experiment of cryptocurrency, and all it's related technologies, started on Janurary 3rd, 2009 when Satoshi Nakamoto mined the first Bitcoin block. Since then the space has evolved tremendously, seemingly on a four year time scale. Yesterday, notable altcoins such as Ethereum, Ripple, Vechain, 0x, Bitcoin Cash, and others dropped 10-30%, painting the market with the color of blood. Fortunes were lost, fortunes were gained. How did this happen? Bitcoin was created Jan 3, 2009, and it reached an (all time high) ATH of $1150 per coin on Dec 4, 2013. Nearly four years later Bitcoin reached a new ATH of $20,000 per coin on Dev 17, 2017. Clearly the cryptoeconomy follows, as of now, a rough four year cycle. 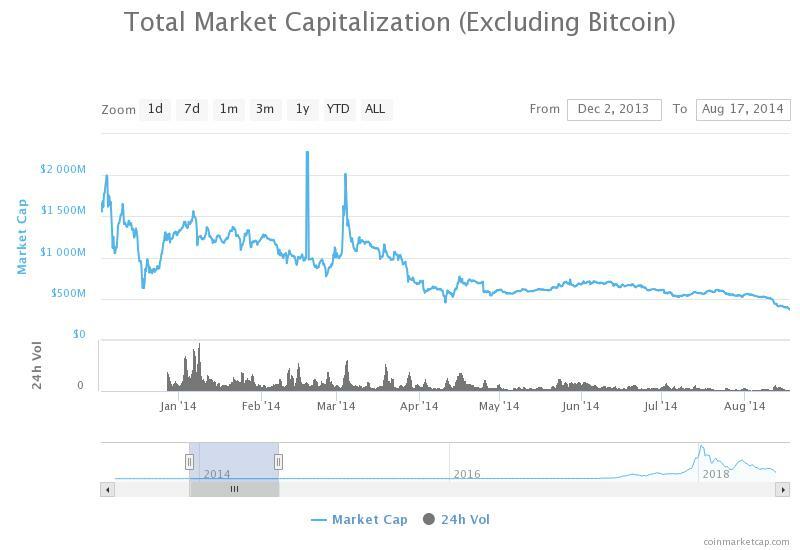 So after the ATH on Dec 4, 2013, when did Bitcoin and the combined altcoin market reach new local all time low's (ATL)? Well here are the stats, and then let's compare them to the present day stats because the trend is strikingly similar. For the purpose of this article I've rounded out a few numbers. 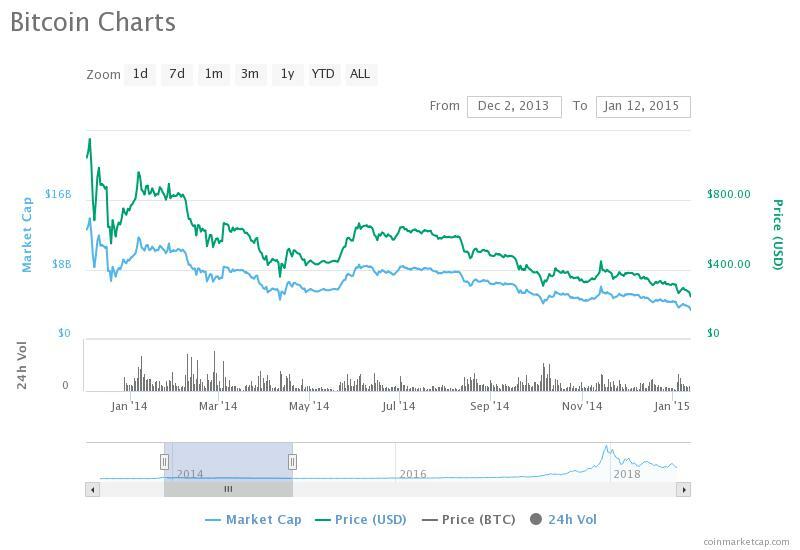 As you can see, the altcoin market bottomed out before bitcoin did. A simple explanation for this is people sold their altcoins for Bitcoin, and the remaining few who didn't sell buoyed the price through HODLing. Then as time progresses people continued to sell Bitcoin for fiat currencies such as USD, EUR, etc. This is strikingly familiar to me. On the day (Aug 13-14th, 2018) of the altcoin massacre, Bitcoin remained relatively stable at $6,000 per coin. Obviously Bitcoin had a strong selling pressure, but I think it was kept afloat by the strong exodus of people swapping their altcoins for Bitcoin. 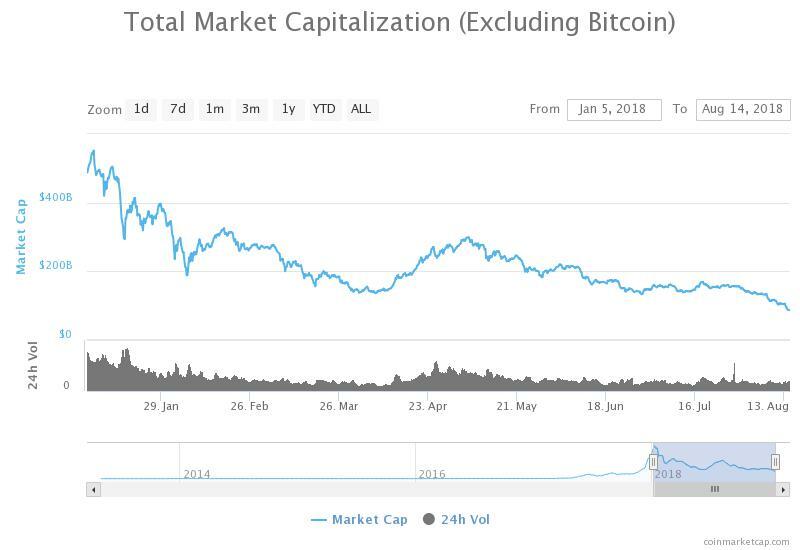 If the trend repeats itself, the next few weeks will be the bottom for altcoins, and as they stabilize, bitcoin will continue to fall until $4,800 to $5,000 approximately. Since the cryptoeconomy is more developed than it was in 2013-2015, I expect Bitcoin to drop less than the 85% it dropped four years ago. A retrace to 70-75% is more appropriate in my opinion. Unlike most people, I won't tell you to buy at the ATH. Instead I'll leave you with the data up above and this quote from Baron Rothschild, an 18th century British nobleman.